The water was flowing out. 水が流れ出ていた. The oil flowed over the rim of the drum. 油はドラム缶をあふれて流れ出した. Tears flowed from his eyes. 涙が彼の目からこぼれた. The river flows into the bay. その川は湾に注いでいる. The Thames flows through London. テムズ川はロンドンを貫流する. Scientific brains flowed into America. アメリカに科学頭脳が流れ込んでいった. The years flow away. 歳月は流れ去る. Traffic flows along the street all day. 通りの交通の流れが終日切れない. Orders for the new product flowed in upon them. その新製品の注文が彼らのもとに殺到した. Her long hair flowed down her back. 彼女の長い髪の毛が背中に垂れ下がっていた. Success flows from health and intelligence. 成功は健康と頭の良さから生まれる. a land flowing with milk and honey 乳と蜜の豊かな土地 《★聖書「出エジプト記」から》. the flow of a river 川の流れ. a flow of conversation [ideas] 流れるような談話[発想]. The tide was on [at] the flow. 潮が上げて[差して]いた. The Mississippi River flows through ten states. Tears flowed down her cheeks. The high pressure system flowed up north making a change in our weather. An electric current flows from positive to negative. The tide began to flow rapidly. The flood waters flowed over the bank. When the game was over, the crowd flowed out of the ballpark. No one could stop the angry crowd from flowing into the building. Young qualified professionals flowed out of the country. Money is flowing out of the country. Her hair flows over her shoulders . After the victory, the champagne flowed like water. In Las Vegas, the casinos flow with money. After having a glass of wine, our conversation began to flow. Words of congratulation kept flowing in. Compassion for the poor flowed through her. His mental problems flow from his childhood experiences. There is a constant flow of water from the spring. The doctor stemmed the flow of blood from his wound. The tide is on the flow. A house was carried away by the flow. I gave up and went with the flow. The game was in full flow by the time we got there. The tide began to flow (in) rapidly. Her hair flows over her shoulders[in the wind]. Money is flowing out of [into] the country. His words flowed on for hours and hours. It's here that the river flows down into the ocean. ・A diode allows current to flow in only one direction. ダイオードは一方向にしか電流を流さない. ・The text will flow around the table. テキストは表のまわりに流れ込む. 流れ; 《DTP で, テキストの》 流し込み. The transfer of a verb from one LU to another. Any of the different members of the Flow dimension. 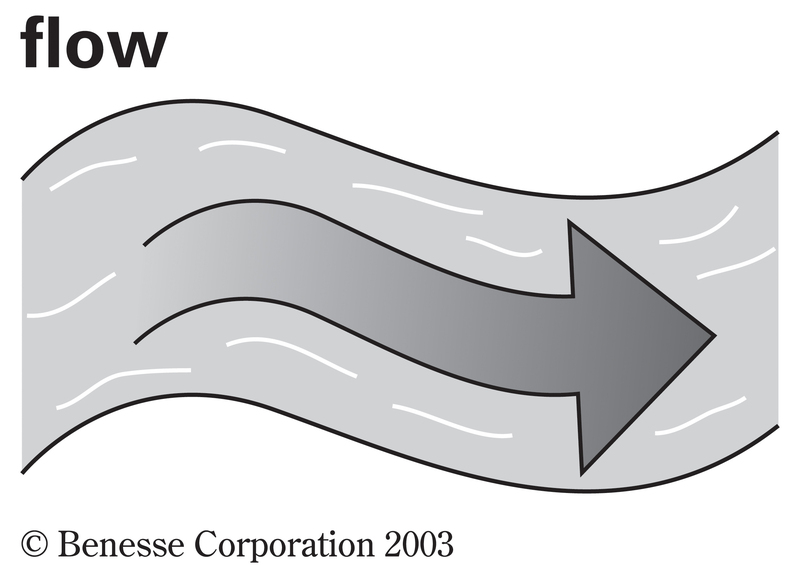 From Middle English flowen, from 古期英語 flōwan (“to flow”), from Proto-Germanic *flōaną (“to flow”), from Proto-Indo-European *plōw-, lengthened o-grade form of *plew- (“to fly, flow, run”). The movement of a real or figurative fluid. (mathematics) A formalization of the idea of the motion of particles in a fluid, as a group action of the real numbers on a set. The notion of flow is basic to the study of ordinary differential equations. The rising movement of the tide. The room was small, but it had good symmetry and flow. The amount of a fluid that moves or the rate of fluid movement. Turn on the valve and make sure you have sufficient flow. Other devices measure water flow in streams fed by melted ice. (psychology) A mental state characterized by concentration, focus and enjoyment of a given task. The emission of blood during menstruation. Tampons can be small or large, slender or thick. From “slender” to “super”, you can pick the size that matches your flow. (rap music slang) The ability to skilfully rap along to a beat. The production on his new mixtape is mediocre but his flow is on point. (intransitive) To move as a fluid from one position to another. Rivers flow from springs and lakes. Tears flow from the eyes. (intransitive) To proceed; to issue forth. Wealth flows from industry and economy. Those thousand decencies that daily flow / From all her words and actions. (intransitive) To move or match smoothly, gracefully, or continuously. The writing is grammatically correct, but it just doesn't flow. Virgil is sweet and flowing in his hexameters. (intransitive) To have or be in abundance; to abound, so as to run or flow over. In that day […] the hills shall flow with milk. (intransitive) To hang loosely and wave. (intransitive) To rise, as the tide; opposed to ebb. The tide flows twice in twenty-four hours. (transitive, computing) To arrange (text in a wordprocessor, etc.) so that it wraps neatly into a designated space; to reflow. (transitive) To cover with water or other liquid; to overflow; to inundate; to flood. (transitive) To cover with varnish. (intransitive) To discharge excessive blood from the uterus. (Scotland) A morass or marsh.